China's President says his country supports the creation of a Palestinian state with eastern Jerusalem as its capital. China's President, Xi Jinping, announced on Thursday that his country supports the creation of a Palestinian state with eastern Jerusalem as its capital, based on the pre-1967 borders. 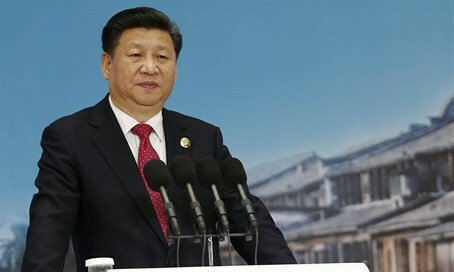 Xi’s comments were made during a visit to Cairo and were reported by the Egyptian Al-Ahram newspaper. He also said that China would provide $30 million in humanitarian aid to Syria, Jordan, Lebanon, Libya and Yemen in 2016, as well as $300 million in aid to Arab countries for bolstering law enforcement and police training, according to Al-Ahram. China enjoys strong business connections with Israel, but has also in the past expressed support for a Palestinian state. Also that year, Xi discussed with PA chairman Mahmoud Abbas a four-point proposal for peace talks with Israel. The Chinese proposal focused on an independent Palestinian state, negotiations as the only way to peace, the principle of "land for peace", and guarantees the international community should provide for the progress of the peace process. Despite’s Xi’s comments on Thursday, the Israel-PA peace process remains frozen and has been since 2014, when the PA breached the conditions of talks by unilaterally applying to join international organizations. On Thursday it was reported that the PA is now planning another such move, and is promoting a UN resolution that would condemn Israeli communities in Judea and Samaria as illegal. Abbas, meanwhile, has continued to incite to terrorism against Jews, having recently called on Palestinian Arabs to “liberate” the Al-Aqsa Mosque in Jerusalem from Jews and their “filthy feet”. On Thursday, he claimed to Israeli journalists that he tried to arrange a meeting with Prime Minister Binyamin Netanyahu two months ago, and was snubbed. Netanyahu's staff responded to the claims, saying, "he (Abbas) has already claimed this in the past, and we denied it. ...It isn't correct. This is an attempt by Abbas to evade his responsibility for the absence of negotiations. Even today in Davos Netanyahu called on Abbas to return to negotiations without preconditions."